Welcome to K&A Flooring in Vancouver, B.C. At K&A Flooring we specialize in providing flooring services to Residential and Commercial customers in the Property Management Industry in Vancouver and surrounding areas of beautiful British Columbia. 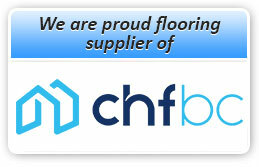 We are a proud supplier of quality flooring products to CHF BC (Co-operative Housing Federation of BC). We are also an ICC (Insurance Claims Collaborative) Program Retailer and work together with Insurance Providers and Restoration Companies to ensure that Owners and Tenants in need of replacement flooring are accommodated quickly. We have over 40 years combined experience in the flooring industry. We are a team of professionals with high quality standards. We offer superior personalized service with integrity and a responsible approach. Your satisfaction is our priority and we are ready to go that " Extra Mile ". Please, click to see our REFERENCES. and residential linoleum as well as ceramic tile. We serve businesses in Vancouver Richmond, Burnaby, Tsawwassen, Surrey, Coquitlam, Port Coquitlam, Maple Ridge, Langley. Please, Call us for FREE estimate at (604)241-1170.